William Claiborne Williams (called “Billy”) was born on 9 October 1856 to Luticia and Jesse Claiborne in St. Francois County, Missouri. [Unless otherwise noted, all of the biographical data here for William Williams and his descendants is provided by Evelyn Spradlin (a descendant of David Richardson Williams) in personal correspondence with Joshua A. Claybourn.] 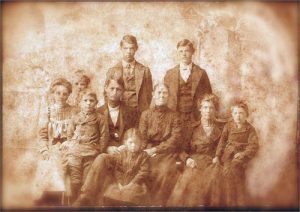 On 10 October 1880 he married Harriett Rosetta England in Van Buren County, Arkansas. [Harriett England was born on 9 April 1856 in Leslie, Searcy County, Arkansas, to John McCamey England and LaVesta Ann Hamilton. 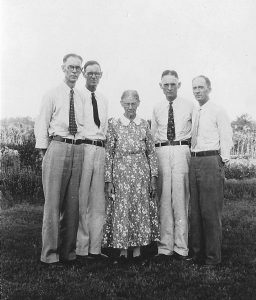 Harriett’s parents were natives of Tennessee. 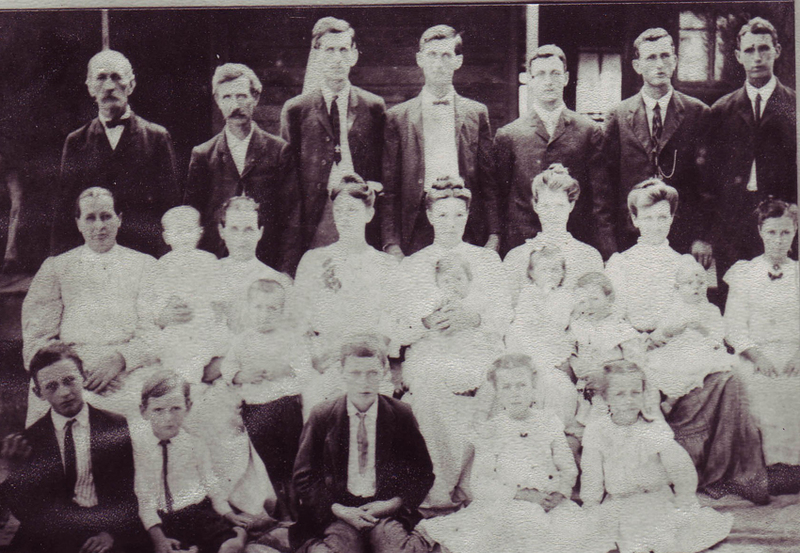 They were married in Missouri and they were the parents of fifteen children, seven sons and eight daughters. In addition to Harriett, one of the children was Zoie England, who married Jesse Milton Williams. John McCamey England died in 1870. He was a member of the Methodist Episcopal Church and of the Masonic fraternity.] Harriett’s sister Zoie married William’s brother Jesse. William died on 24 November 1932 and Harriett followed on 2 May 1941, both in Quitman, Cleburne County, Arkansas. They are buried in Mt. Pleasant Cemetery in Faulkner County, Arkansas. Esther Williams was born on 3 October 1883 in Quitman, Arkansas and on 6 November 1902 married Pinkney Louis Johnson (born on 17 September 1881) in Quitman, Cleburne County, Arkansas. They had five children together, listed below, and were members of First United Methodist Church. Pinkney died on 16 May 1945 in Quitman and thereafter Esther moved with her children and sister Zoe to Clinton, Arkansas. Esther died on 25 January 1982. Pinkney and Esther are both buried at Quitman Methodist Church Cemetery. 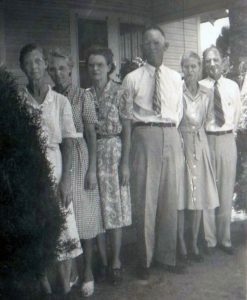 Back row: Price Johnson, Joe Hutchens, George Johnson, Louis Johnson, Noah Johnson, Walter Johnson, James Johnson; Middle row: Celine Johnson, Mary Hutchens and two children, Emily Johnson Swar, Lucy Johnson and Carl, Esther Johnson with Lillian and Ralph, Frankie Johnson with Winnie, Joe Hutchens’ daughter; Front row: Willie Johnson, Jack Johnson, Alvin Hutchens, two of Joe Hutchens’ daughters. Ralph Fenton Johnson was born on 20 November 1903 in Quitman, Cleburne County, Arkansas. He married Lou Esther Hooten (“Esther”) on 4 December 1924. [Esther Johnson was born on 11 February 1903 in Quitman, Cleburne County, Arkansas.] Together they had three children. Ralph died on 7 March 1960 and Esther followed on 24 July 1989, both in Las Cruces, New Mexico. Eula Jean Johnson was born in about 1928. Neva Jo Johnson was born on 15 March 1929 in Arkansas and married Eugene Ferrell (born in about 1925). Ina Lou Johnson was born on 26 Dec 1930 in Arkansas. She married in 1950 to Lloyd M. Varenkamp (born in about 1930) in 1950 in Las Cruces, New Mexico. Lillian Johnson was born on 24 October 1905 in Quitman, Cleburne County, Arkansas. 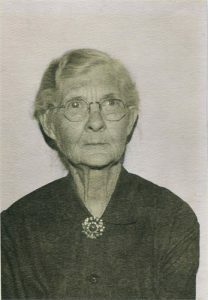 She married Ezra John Selby on 25 Nov 1925 in Cleburne County. [Ezra Selby was born on 9 September 1897.] Lillian was secretary to the first processing plant which is now Con-Agra, and later secretary at Van Buren County Democrat. Lillian and her family were members of the First United Methodist Church and attended regularly. She was a member of the choir, guild, then Circles, serving in many capacities. The youth remembered her for her dainty cookies and playing piano anywhere she was needed. She was also a charter member of the Business & Professional Women’s Club. After retiring, she cared many years for her mother, who later lived in the nursing home. She also cared for her aunt Zoe until her death. Ezra died on 16 January 1975 and in about 1980 Lillian put herself in the nursing home. She was an avid reader and read every good book in the library. Very compassionate, she visited and comforted her neighbors in the nursing home. Lillian died on 29 July 2000 in Cleburne County. Claiborne Price Johnson was born on 2 December 1908 in Quitman, Cleburne County, Arkansas. He married Claribel Reading on 15 June 1932 in Yuma, Arizona. They had three children together. Claiborne died on 27 September 1956 in Santoga, California, and Claribel followed in April 1972 in Mesa, Arizona. James Leslie Johnson was born on 8 August 1929 in El Centro, California and married Barbara Jean Moore in November 1950. Mary Lou Johnson was born on 15 October 1948 in San Louis Obispo, California. She married (1st) Frank Anthony Ellis on 7 June 1969 in Australia. [Frank Ellis was born on 2 March 1948 in Leistershire, England.] Mary Lou and Frank divorced, and Mary Lou married (2nd) James Williams. Robert Henry Johnson was born on 7 December 1954 in California. George Carroll Johnson was born on 7 June 1911 in Arkansas. He married Cora Jean Largen on 23 February 1940 to Cora Jean Largen (born in about 1920) in Santa Paula, California. George died on 10 July 2000 in Santa Paula. Rosaline Johnson was born on 6 September 1914 and died just twelve years later on 19 October 1936, all in Quitman, Cleburne County, Arkansas. Grover Cleveland Williams Sr. was born on 5 November 1886 in Quitman, Cleburne County, Arkansas. He married (1st) Ina Turner on 9 May 1922 in Cleburne County, Arkansas. [Ina Turner was born on 22 May 1889.] Together they had two children, listed below. Grover spent much of his life as a pharmacist in Roswell, New Mexico. Ina died on 22 January 1930 in Arkansas and is buried in the Quitman Methodist Church Cemetery. Grover married (2nd) just a few months later in April 1930 to Alma Bessent. [Alma Bassent was born on 31 October 1904 and died on 16 August 1974.] Grover died on 16 August 1954 in Alamo, Texas. Rosalyn Williams was born on 14 October 1923 to Grover and Ina Williams. She married (1st) Harold Uber in 1945, but the two divorced in 1947. [Harold Uber was born in about 1920] Rosalyn married (2nd) Norman Hayden Arnall on 14 November 1953. [Norman Arnall was born on 7 November 1921 and died on 12 December 2002 in Weslaco, Texas.] Rosalyn died on 14 July 2007. Grover Cleveland Williams Jr. was born on 16 June 1927. He married Mary Gathing Mcnail on 26 August 1951. [Mary Mcnail was born on 21 October 1930.] Together they had four children. Jessica Suzanne Williams was born on 15 December 1954 in Austin, Travis County, Texas. She married George Robert Benson on 1 June 1991. Joseph Carroll Williams was born on 21 March 1888 in Quitman, Cleburne County, Arkansas. 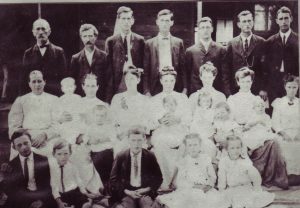 He married Pearl Myrtle Thomas on 14 November 1912 in Cleburne County. [Pearl Thomas was born on 3 August 1891 in Arkansas as the daughter of Dr. Franklin Thomas and Angelete Elizabeth Turney.] Pearl’s brother William married Minnie Williams, Joseph’s younger sister. Joseph died on 2 June 1966 and Pearl followed in death on 17 April 1976, both in Monterey, California. They had seven children together. Crystal Harry Williams (a male) was born on 22 August 1913 in Quitman, Cleburne County, Arkansas. He married Margaret Jane Brown in 1936 in Washington. [Margaret Brown was born on 9 November 1916 in Scafit County, Washington.] Crystal died on 4 October 1967 in Prunedale, California. Margaret followed many years later on 30 September 2000 in Salinas, Salinas County, California. Cleo Louise Williams was born on 26 May 1915 in Quitman, Cleburne County, Arkansas. She married Raymond C. Brandlein in about 1955 in Pacific Grove, California. [Raymond Brandlein was born on 7 July 1918 in San Francisco, California.] Cleo died on 29 August 1967 in Inglewood, California. Raymond died on 29 June 2003 in Forestvill, Sonoma Co., California. Roy Frank Williams was born on 8 February 1917 in Quitman, Cleburne County, Arkansas. He married Hazel Leona Caton in about 1941 in Atwater, Oregon. [Hazel Caton was born on 21 July 1920 in Merced County, California.] Roy died on 5 January 1981 in Atwater, California. Hazel died on 1 January 1997 in Merced County, California. Billie Ruth Williams was born on 20 August 1920 in Quitman, Cleburne County, Arkansas. She married Floyd Leo James in Monterey, California. Floyd died on 17 September 1987 in Shasta, California. Kelsey Thomas Williams was born on 26 December 1926 in Bee Branch, Arkansas. He married (1st) Jean Sharon Godbey in January 1956. [Jean Godbey was born in about 1935.] Kelsey married (2nd) Barbara Jane Fisher in about 1945 in Monterey Co., California, but they later divorced. [Barbara Fisher was born in about 1928.] Kelsey married (3rd) Marsha Lynn Love in May 1977. [Marsha Love was born in about 1945.] Kelsey died on 2 August 2004 in Bakersfield, California. Minnie Williams was born on 25 May 1890 in Quitman, Cleburne County, Arkansas. She married William Marvin Thomas on 12 November 1910 in Cleburne County, Arkansas. [William Thomas was born on 9 April 1883 in Van Buren County, Arkansas, to Dr. Franklin Thomas and Angelete Elizabeth Turney.] William’s brother Pearl married Minnie’s brother Joseph. William died on 20 October 1961 and Minnie died on 2 August 1981 in Albuquerque, New Mexico. Clyde D. Thomas was born on 3 January 1911 and died in July 1986 in Albuquerque, New Mexico. Zoe Williams was born on 22 August 1892 in Quitman, Cleburne County, Arkansas. She married Dr. Franklin D. D. Moore on 3 April 1931 in Quitman. [Franklin Moore was born on 10 February 1865.] 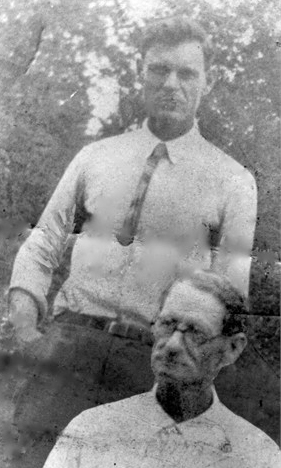 Dr. Franklin Moore died on 6 December 1940 in Quitman. Zoe died on 8 April 1978 in Clinton, Arkansas. Robert England Williams was born on 21 July 1895 in Quitman, Cleburne County, Arkansas. He married Lola May Curtis on 10 Nov 1927 in Marshall, Arkansas. Lola died in October 1977 and Robert followed on 16 December 1978 in Fayetteville, Arkansas. Jesse Williams (“Jess”) was born as a twin on 25 January 1897 in Quitman, Cleburne County, Arkansas. 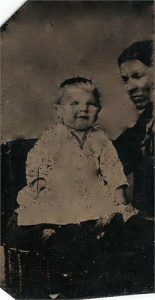 He married Nancy “Nannie” Crownover (born in about 1900) on 18 May 1923. They lived at Plainview, Arkansas, for twenty-five years. There Jess worked for Mathis Grocery and was a Mason and member of the American Legion. He and Nancy were members of Plainview Methodist Church. Jesse died on 2 July 1960 in Little Rock, Pulaski County, Arkansas. Johnnie Williams (a girl) was born as a twin on 25 January 1897 in Quitman, Cleburne County, Arkansas. She married Martin Era Phillips on 29 May 1920 in Cleburne County. 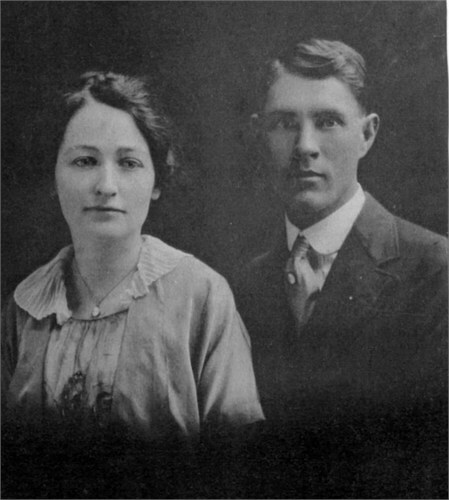 She married Martin Era Phillips on 29 May 1920 in Cleburne County. Johnnie died on 4 June 1966 in Winton, California. Martin followed on 30 January 1985 in Merced County, California. Both are buried in Mount Pleasant Cemetery, Faulkner County, Arkansas. Together they had five children. 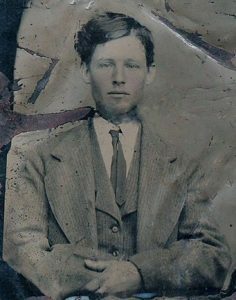 Robert Wayne Phillips died on 18 April 1923 in Quitman, Cleburne County, Arkansas. He married Mary Jane Gentry on 11 June 1943 in Pittsburg, California. [Mark was born on 1 Oct 1924.] Mary died on 12 March 1989 in Quitman. Betty Jean Phillips was born on 23 February 1926 in Quitman, Cleburne County, Arkansas. She married Kenneth Eldon Debusk on 19 May 1945 in Greenbriar, Faulkner County, Arkansas. [Kenneth Debusk was born on 27 September 1920.] Kenneth died on 14 May 2001 in Quitman. Wilma June Phillips was born on 18 June 1928 in Quitman, Cleburne County, Arkansas. Jessie Martin Phillips was born on 8 April 1930 in Quitman, Cleburne County, Arkansas. He married Alma Jean Brassell on 5 March 1956 in Carson City, Nevada. William Claiborne Phillips was born on 21 September 1932 in Quitman, Cleburne County, Arkansas. He married Marian Baty on 12 November 1959 in Merced County, California.